"I thought she was going to die like the three others before her"
“I had given up hope on my grandchild. I thought she was going to die like the three others before her,” says Eisa Wasaitu, Zahari’s grandmother. The one-year-old was suffering from severe acute malnutrition (SAM) and marasmus when she was first brought to the Médecins Sans Frontières outreach post. Zahari's mother is also ailing and suffers from psychosis. She is in no condition to take care of Zahari and her older brother leaving the grandmother as their sole guardian. After two months in the Médecins Sans Frontières programme and admission into the stabilisation centre (SC) where, apart from being treated for malnutrition, she was given specialised treatment for pneumonia, Zahari slowly blossomed back to life. When we saw her a few weeks ago, her weight had increased from 3.2 kilograms to 4.9 kilograms. “When I see this child I feel very happy because the grandmother and the rest of the community thought she was going to die, but we saved her life and she is still alive,” says Nabiyu Ayalew, Médecins Sans Frontières' outreach nurse. Médecins Sans Frontières traversed the inimitable lands of Afar in April to respond to a nutritional emergency. 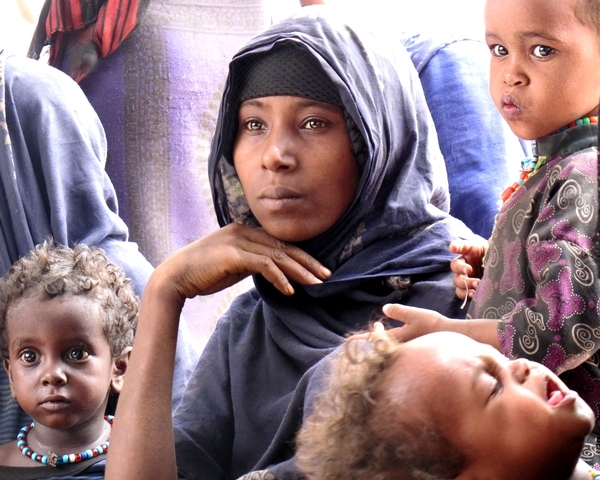 The Afar state is vast and the area that Médecins Sans Frontières covers is one of the most remote and most neglected. The Médecins Sans Frontières team is based in Teru is, which is the most remote zone of Afar state. Teru is subject to huge aggressive sand storms in the dry season with extreme temperature and violent rainstorms that flood seasonal rivers and make non-existent and partly marram (grass) roads impassable in the rainy season. Médecins Sans Frontières' intervention which recently closed, covered twelve Kebeles, all of which were very far from each other and whose inhabitants are completely cut off from health care. The decision to intervene was reached after an assessment found an alarming severe acute malnutrition rate in the region to be 26.6% in an estimated catchment population of 87,374 people. “Most of the cases that we admit in the Stabilisation Centre are Severe Acute Malnutrition with complications - most of these are combined with either pneumonia or TB,” says Frank Katambula, Médecins Sans Frontières' Medical Team Leader in Afar. Médecins Sans Frontières has been providing therapeutic feeding alongside treatment for various diseases like pneumonia and tuberculosis. Some cases, like that of Salama Hassan, whose nine-month-old baby has been admitted three times in the Médecins Sans Frontières stabilization centre, have been particularly problematic. Salama does not believe that her child suffers from malnutrition but that a bad wind must have blown when they were released from the stabilization centre and this wind made her child sick. Nevertheless, most cases have now stabilised and children under the age of five continue to receive therapeutic food. Overall, a total of 726 malnourished children were admitted in the therapeutic feeding programme (TFP) (including 134 children in the SC) and 1,154 moderately acute malnourished (MAM) patients (including 416 pregnant and lactating women - PLW) benefitted from the programme. “In total we have 78.2% cured cases and a defaulter rate of 4.5%, which to me is quiet ‘good’ considering that access (in terms of accessing patients and patients accessing healthcare/ Médecins Sans Frontières facilities) in this area is not at all easy,” adds, Jean François Saint-Sauveur, Médecins Sans Frontières' Medical Coordinator in Ethiopia. The presence of Médecins Sans Frontières in the area is significant, not only in providing healthcare but also in highlighting the healthcare problems of the rural Afari population and advocating for the provision of basic healthcare to this population, a principle clearly stated in Médecins Sans Frontières' charter. *Patients who do not complete the full course of treatment.